It would be easy to assume that feeding your beloved pets hearty meals, table scraps, and extra treats is a sign of love. However, overfeeding a cat or dog can lead to health problems which could be difficult to manage. Just like us, it’s important for all animals to have the right balanced diet to ensure they stay in good health. Right now, many pet owners across the UK are unknowingly failing to do this. Our own research found that 86% of pet owners are giving their pets extra snacks and treats outside of typical meal times and over half (58%) never even look at the calorie content of snacks and treats. To help pet owners effectively manage their animal’s diet, we’ve developed a pet calorie calculator with ‘Vets in Practice’ star, Emma Milne. The calculator has been designed specifically to measure calorie content of human snacks and treats commonly given to pets, comparing the intake to the human equivalent number of burgers that have been consumed in a given week! 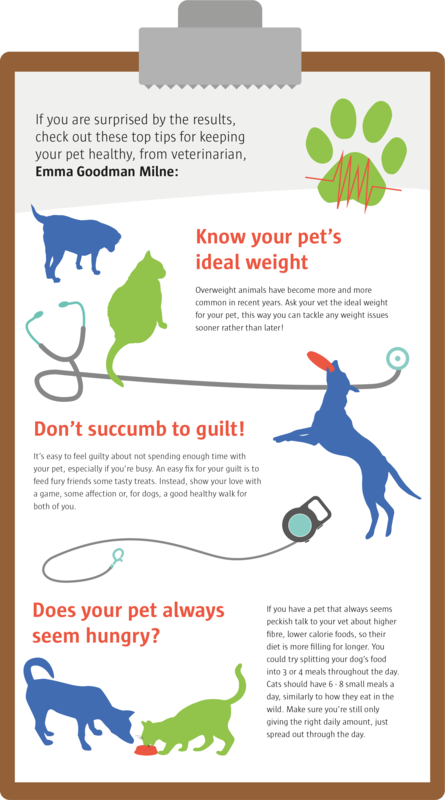 What is your dog’s ideal weight? Always remember to calculate calorie requirements for the weight your dog should be, not necessarily the weight he or she is! Ask your vet what your animal's ideal weight should be if you are unsure. What snacks does your dog eat? Thinking of an average week, how many of each of the below snacks do you feed your dog? What is your cat’s ideal weight? Always remember to calculate calorie requirements for the weight your cat should be, not necessarily the weight he or she is! Ask your vet what your animal's ideal weight should be if you are unsure. How active is your cat? What snacks does your cat eat? Thinking of an average week, how many of each of the below snacks do you feed your cat? Pets in cars, do you know the law?